"Southwest Florida is about more than just Mickey Mouse and other manmade theme parks and commercialized tourism spots," said Roger Dykstra, owner of Orchids & Egrets EcoTours. And he would know: He has been offering guided tours in Florida’s southwest since 1996. Feeling a need to "get back to nature," Dykstra and his wife started their educational tours in order to help others learn about the subtle beauty and the variety of species in this unique Everglades ecosystem. So I selected their half-day Everglades 101 tour for a taste of their knowledge and experience. The Everglades 101 tour began at a Naples resort. On the way to our first stop, Dykstra provided an interesting narrative about the area we were about to discover, the diversity of all the species and how each species is important to this region. "South Florida is a vast wetland region that encompasses the Everglades and attendant ecosystems, and is one of the Earth’s most diverse regions for plants and animals," Dykstra said. "Its botanical significance with over 3,500 plant, 425 bird and 184 amphibian and reptile species justifies its designation as a Natural Heritage Site by the United Nations." He talked about how important the water is to this delicate ecosystem and explained that the Everglades itself actually begins in the middle of the state at the mouth of the Okeechobee River. This is an area commonly referred to as the "River of Grass," and made famous by the late environmentalist Marjory Stoneman Douglas in her book with the same name. Dykstra also provided a discussion about the invasive and destructive melaleuca and Brazilian pepper trees. About 45 minutes later, our van pulled up to a 2,000-foot-long boardwalk nestled in the Big Cypress Bend of Fakahatchee Strand State Preserve, just off the Tamiami Trail. The Big Cypress Bend region of the Fakahatchee Strand was the only part of the swamp that was spared from the cypress logging activities in the 1940s and 1950s, and because of the remaining virgin trees, it was designated a National Natural Landmark. Fakahatchee Strand State Preserve is a unique and natural protected area located in eastern Collier County. It is home to an amazing array of flora and fauna, and the elusive and endangered Florida panther, which once roamed in large numbers even 20 years ago. Within the preserve can also be found the wood stork and the Florida black bear, as well as unique and rare species of orchids. In fact, Fakahatchee is often referred to as the "orchid capital of the United States, and is home to 44 native orchids, 14 bromeliads and 32 ferns, according to Mike Owen, a biologist with the Division of Parks. A "strand" consists of a biological community of both flora and fauna as well as wetlands and uplands, and it typically has a naturally flowing waterway running through its center. The Fakahatchee Strand is the major drainage slough of the southwestern Big Cypress Swamp, as well as the largest and most unusual of the strands. The strand in its entirety is about 3 to 5 miles wide and approximately 20 miles long. It is truly a nature lover’s delight! Unfortunately for the tour guests, while meandering through the old-growth cypress, the mosquitoes were out in full force, making our walk almost unbearable as our guide pointed out various species of flora and fauna. However, we were fortunate to see a red-shouldered hawk, several herons and an ibis. Dykstra pointed out the red maple, cabbage palm and royal palm trees, and the Florida state tree -- the sable palm. And there were also numerous ferns, including the leather fern, strap fern and the royal fern. Another interesting tree is the strangler fig, which gets its name from the way in which it grows, by encircling the host plant in a "strangling" sort of embrace. The Central Slough meanders through the center of the swamp in the deepest part of the Fakahatchee Strand. Here in this damp, dark preserve one can find an abundance of tropical epiphytes, such as bromeliads and orchids. These particular plants don’t have roots in the soil in which to draw their moisture; they grow on trees instead. Dykstra told the group there were about 16 species of bromeliads found here in the protected preserve. He pointed out the resurrection fern, one of the more interesting epiphytes because it can’t store water. If several days pass without rain, the resurrection fern’s life functions cease, and it curls up and turns brown, giving the appearance of being dead -- that is, until the next rains come along and "resurrect" it. We hit the jackpot by spotting a pair of nesting eagles, and our brisk walk to the end of the boardwalk provided us with another nice surprise: 3 baby alligators sunning themselves on logs in the dimly lit canopy, while their mother lay close by, watching her young. Following our boardwalk tour, we boarded the van and were off to nearby Marco Island for the boat portion of our tour. Along the way, Dykstra told us about the Calusa Indians who had lived in these parts hundreds of years earlier. They actually had built their homes up high, away from the damaging water and storm surges, on shell mounds, which still exist today. We arrived in about 20 minutes and were met by crew members who assisted us in boarding a small pontoon boat. The boat stopped several times so Dykstra could point out the native flora and fauna, especially the various types of mangroves found in this area. We did manage to see numerous pelicans and the bright red-breasted frigate, as well as 2 ospreys, one carrying fish to its mate and the other nesting on a channel marker. It seemed we had barely gone out when we were circling and heading back into the marina. In spite of the mosquitoes, I do believe the guests generally had a good time while being given a glimpse into this unique ecosystem we call the Everglades. And I personally always come away from these tours with a deeper appreciation of this national treasure. Freelance writer and 20-year Floridian resident Maureen Sullivan-Hartung is a friend, lover and supporter of the Florida Everglades. 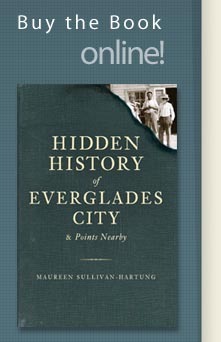 She holds membership in the Friends of the Everglades organization, founded by the late Marjory Stoneman Douglas; and has written many articles about this unique treasure for numerous publications over the years.